Those who make it, however, are rewarded with a unique cultural experience and a lack of other tourists. Sometimes, it is just nice to have a tourist attraction all to yourself. So what is there to do in Kashgar? Kashgar’s Old Town is the heart of the city. 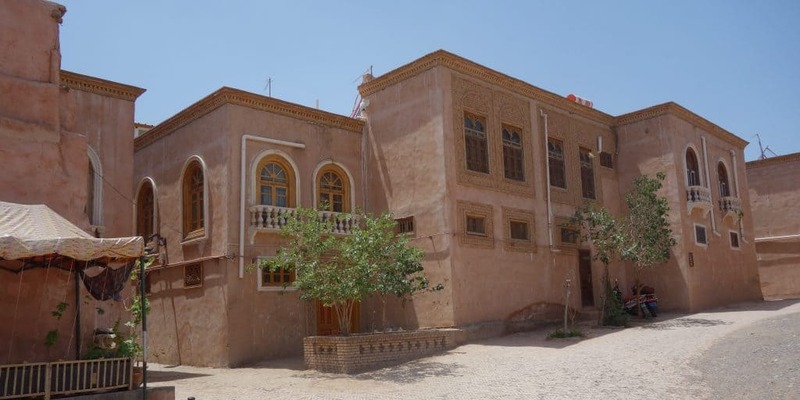 Most historical buildings have been destroyed over the centuries, but the Old Town gives you an example of what Kashgar might once have looked like. You will find many restaurants and shops in the Old Town and you can easily spend hours exploring the alleys and watching daily life go by. For muslims, the Afaq Khoja Mausoleum is the holiest place in the Chinese province of Xinjiang. It dates from the 17th century. 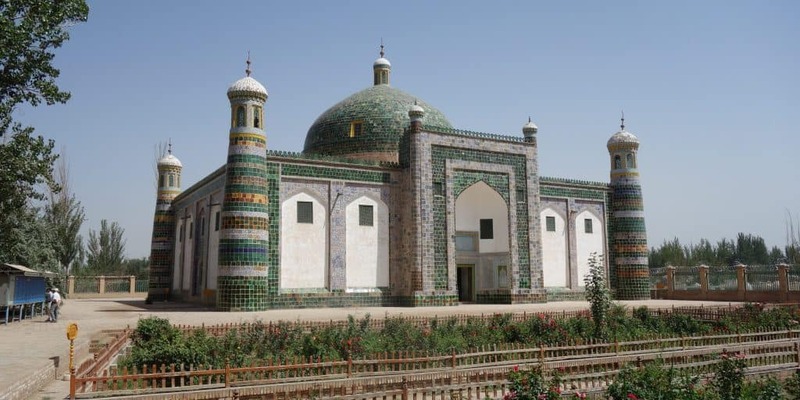 Afaq Khoja was an Uighur leader but the tomb is more famous because one of the emperor’s concubines is also buried here. She was known as the Fragrant Concubine because apparently, she was famous for her good body smell. Don’t worry, the smell has long since worn off. But the building is still beautiful and worth visiting. 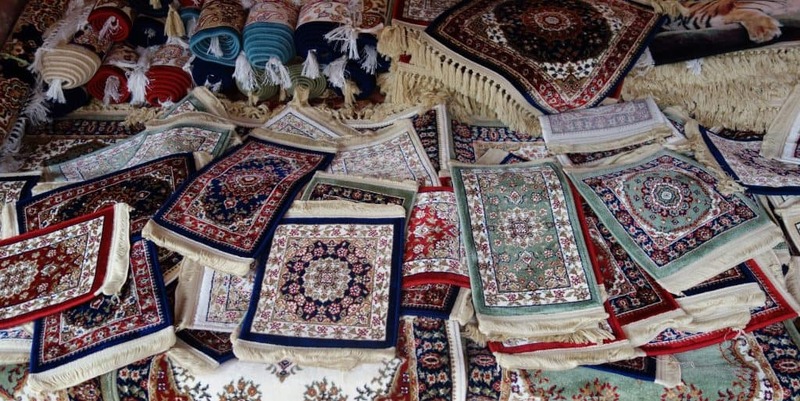 Kashgar’s biggest bazaar is located next to the Old Town and has everything on offer that you could possibly ask for. Near the main entrance, you will find the souvenir sellers. Go out towards the back if you’re looking for nuts and dried fruit. Don’t miss the medicines section close to the souvenir shops if you want to see dried geckos and snakes. I wonder whether or not this one would have been my number one if I had gotten to visit it properly. The Kashgar Sunday Bazaar is the largest lifestock market in Central Asia. 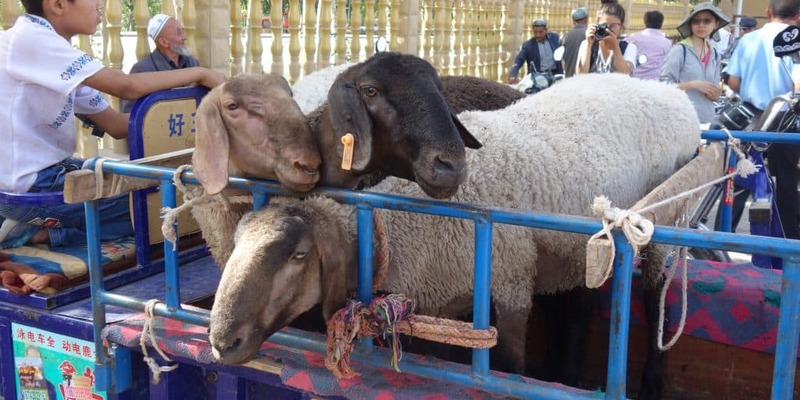 Whether you want to buy sheep, goats or a camel, you can get it here. I was so excited about this bazaar. We went there – and it was almost empty. Unfortunately, the week we went, the president of China was visiting Kashgar, which meant roadblocks and no Sunday Bazaar. If you get to witness the real one, please let me know because I would love to hear about it. 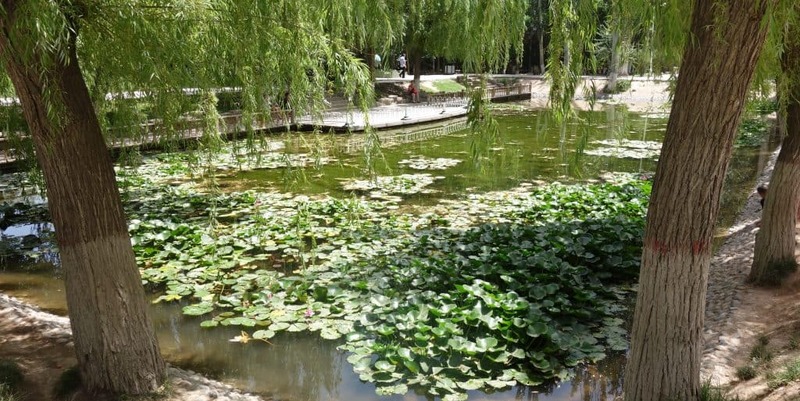 People’s Park is the perfect place for people-watching or relaxing in the shade of trees. Locals come here for a walk, to exercise, sing, dance and play chess or cards. We got to see traditional Uighur songs and dances. People’s Park cannot be accessed from People’s Square. You have to walk down one of the streets on the side of the park to get in. From the Old Town and in front of the bazaar, you might be able to see a ferris wheel. It is not difficult to find, cheap and you will likely be the only person on it. The view from the top is nice because it gives you an overview of Kashgar, of the Old Town, the bazaar, the parks – and the many police checkpoints. The ethnic minority living in Kashgar, the Uighur, have a very distinct culture. Their language, traditions and food are different to what you will find in the rest of the country. I can highly recommend the Uighur noodle dishes you can find all over the town. We found a small noodle bar close to our hotel that we went to for lunch and dinner, trying the different variations of noddles. While most dishes were simple, they were some of the best noodles we’d had in the whole of China. 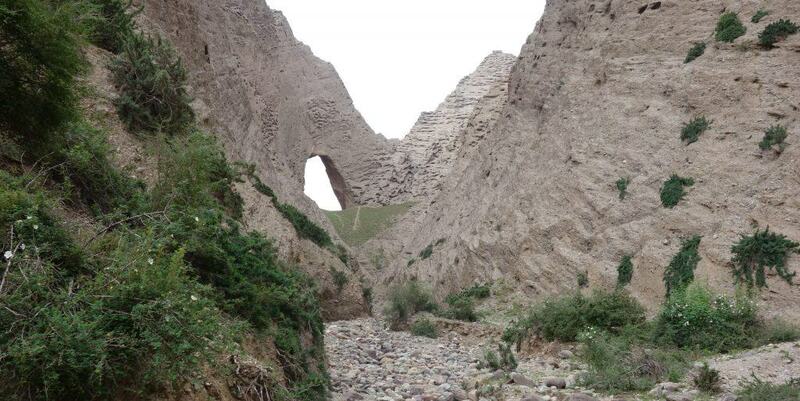 Shipton’s Arch, located at about an hour or two from Kashgar, is the world’s tallest rock arch. It doesn’t look like much in the advertisments or in my photo (taking decent photos is impossible because it is so large) but I highly recommend you to go there if you have a spare day in Kashgar. Leave early in the morning to escape the heat and wear good shoes as you will have to hike through a rocky river bed. Once you get there, the arch is very impressive. Even from the lookout point, you cannot properly see how far down it goes. All you can see is that it is huge.